The MHS Board meets the third Wednesday of the month at 5:30. Pratt Hall in the summer, Public Safety Building Conference Room in the winter. Great gifts. Notecards and Michael Domina prints are still available. 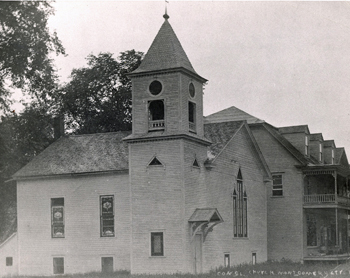 Originally named the Union Church in the 1830s, when was Pratt Hall renamed St. Bartholomew's? Excerpt from the Teaching American History Professional Development Program Core Activities for Teachers grant proposal, emphasis added... "Goal 1: Increase teacher knowledge and understanding of... historical eras, with an emphasis on democratic principals of freedom, justice, and equality as articulated in national and Vermont founding documents. " While I'm not an expert on education in any way this seems basic to our mission and a natural fit. We host school visits, award scholarships, mount exhibits, and sponsor speakers; and now with any luck we will be able to support area teachers with our humble collection and energetic people. The Board agreed to sign our organization up for the program and is enthusiastic about our potential role. Two special acknowledgments in this edition. Robert Farrar of Orleans, VT donated about a dozen panorama photos of the Nelson and Hall log yard, HQ Building, and logging activities. The collection included pictures of vehicles (six steam? stacks) and views of Montgomery Center from across the Trout River. The St. Albans Museum also donated two pictures it was de-accessioning, one of the Hutchin's Bridge and the other of the Congregational Church. This is one of the best shots of the church many of us had ever seen. We are sad to report that Penny Bennett passed away recently at the age of 86 at her home in Dover, NJ. Penny and her husband, Jack, have been members of the MHS since 1985 and both actively participated in the MHS activities whenever they were in Montgomery, staying in their house on West Hill. Penny is especially remembered for being "cashier" for many years at the "Concerts on the Common" and for being a saleslady par excellence when the Society held "AugustFest". Penny will also be remembered for her cheerfulness and optimism in spite of her many years battling health problems - she was always full of laughter and had lots of stories to tell of her travels around the world. We will miss her. This year's Membership Appreciation Reception with the artists will be August 27th, and the Show & Sale will be Saturday the 28th. As always the Covered Bridges Garden Club's Harvestfest will also be that day on the Common. Times will be announced in the July newsletter. Jo Anne Bennett (now a grandmother!!!) will be leading our effort to update the Town History book, written by Sara Taylor, Bill Branthoover and Joe Sherman. The new material will cover the last 20 years of developments in the town. Please contact me at 326-4322, via email at daveandjoanne@mymts.net, or via USPS at P.O. Box 91, Montgomery, 05470"
Would You Like A Tour Of Pratt Hall? Last newsletter we announced any MHS member desiring a tour of Pratt Hall for themselves or guests can do so by contacting any member of the Board or emailing us at pratthall@gmail.com. We're expanding that offer to anyone, member or not. Please bear in mind the heat and water are not on until late April. Bill and Margaretta Branthoover were the cover girl and boy of the Montgomery Town Report this year, an honor well deserved. The Report also contained a two page article provided by the Society on the Montgomery to E. Berkshire stage. The Report is still available from the the Town Clerk and this link will take you to an online copy. This year's commemoration will be May 31st at 10:00 at the Montgomery Center upper cemetery. It will include short remarks by a guest speaker, roll call, and military honors by American Legion Post 42 from Enosburg. Please join us in honoring Montgomery's war dead and living veterans. Tentative Dates Set for "Concerts By The Common"
Steve Hays has been busy putting together another wonderful lineup. Right now this is what's in store for us. All concerts start at 8:00p.m. More details will follow. Stay tuned to our web site and signs at Lutz's and in front of Pratt Hall. Consider purchasing a Season's Ticket, it's a great value. 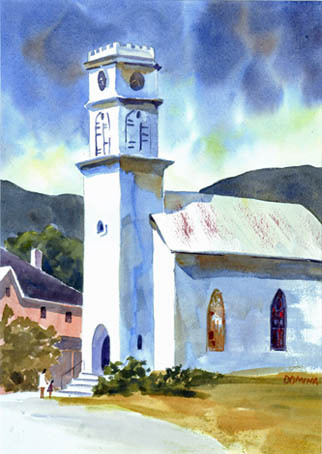 Authors Nicholas & Deborah Clifford present "The Troubled Roar of the Waters: Vermont in Flood and Recovery, 1927-1931" 7:00p.m. at the Public Safety Building Conference Room. FREE. The Flood is remembered as the greatest natural disaster ever to strike Vermont, yet it is far more that an episode restricted to the history of a single state. An examination of the flood and reconstruction helps shed light on important facets of our national history, and helps us understand America's passage through the difficult years of the 1920's. Sponsored by the Montgomery Library. Note: We must cover $7,500.00 to match the VT Historic Preservation Grant for repairs/restoration to the front entry of Pratt Hall. You should have received a membership renewal by now. Your financial support, or donation of services or materials in kind, are greatly appreciated and have a direct and immediate impact on Montgomery. Membership is the life blood of the MHS. Additional donations targeted to specific purposes, like the stained glass windows or scholarships are welcome. All donations are tax deductible. Receipts are available from any Board member upon request. Thank You. We're making steady progress on computer cataloging, photographing and moving our holdings to the former Heaton House. Thanks to the hard work of Parma Jewett, Marijke Dollois, and Noela McGroarty we are about halfway there. Special thanks to Curtt Perry for helping with technical and design advice. We are now able to search by keyword and retrieve records that include a picture and storage location information. Bill and Margaretta Branthoover's past efforts to accession items into a card catalog were immensely helpful. Pratt Hall Work To Begin Soon? As of this date we still are unsure of when the repairs and restoration of the clock tower base and front entryway will begin. We've submitted our Description of Work to the VT Div. for Historic Preservation and will be signing a formal Grant Agreement soon. We will then solicit bids, select a prime contractor, and be off to the races. Bill McGroarty will be project lead for the Society assisted by Pat Farmer and Ken Secor. We hope to include some volunteer work as part of our match and will let you all know specific ways you can help. Come and get dirty with us! As a reminder, the Agendas and Minutes, which include the Treasurer's Reports, are available on our web site. What would you like to see the MHS do? Do you have any ideas for exhibits, or any feedback on our programs and activities? Please let us know.